Home Depot gift cards - any amount, to buy paint and brushes. 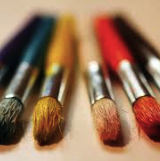 Cash - any amount, to spend at an arts supply store for paint and brushes. Paint brushes #12, #26, #28, round and flat, suited for mural painting. Deliver to the main office.